Soon after his tour begins, a mysterious weapon strikes fear in the hearts of all Star Runners and has the ability to catapult the Legion and Zahl into a galactic war. Not a classic writer, but so worth the read. Can't wait for another story about Austin and the Star Runners! This book is good for any age reader. I would rate it PG, but there are difficult subjects of death, loss, and sacrifice that might be hard for children old enough to understand but not old enough to deal with it. These issues were well-written and very true-to-life. unlike tv, where people suffer tremendous trama & loss and the next day are fine. My dad always said, "if your beliefs aren't worth dying for, they aren't worth living for." Mr. Naramore gave a wonderful performance and really brought the story to life. I hope Mr. Naramore continues to be used as the Star Runner narrator. I need to know who's in the "capsule". What made the experience of listening to Mission Wraith the most enjoyable? The emotions of the characters that flowed throughout the book. They brought the book to life. You feel the emotions when you read the book but he put so much into his reading. He was not reading/narrate but told the story that was taking place. There were several but the one that really moved me I don't want to say because it would be a spoiler. This is the third book of Austin and the Star Runners. Each book lead into the next however you can read each one as a stand alone. Don't know why you would want to. In the words of Austin and his fellow Star Runners "STAY FROSTY". Miss the narration of Donald R Emero. Just not the characters I've enjoyed up to this point. Especially miss Nubern's voice. 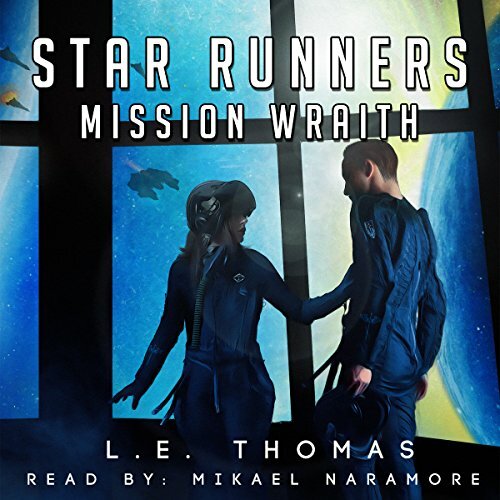 One of the best sci-fi galactic space stories l've ever listened too! All 3 books in fact!! I am so looking forward to the next book from L.E. Thomas in this amazing series!! This one was my most favorite due to the new narrator. The old one was ok but did the main characters voices the same. Im suprised this book has bad reviews when it's such a good story and I would listen to it again. Austin of course since he's the main character and you get to see him grow throughout the series. He's not a fake tough guy like most heroes. He's just a normal fighter pilot that tries his best to do his job. Excitement and humor to the story. You really get a feel for the characters. I loved his military voices. loving the series. please keep it going. i am eagerly waiting for more. once I started had to read all there was. Would you try another book from L.E. Thomas and/or Mikael Naramore? Yes. the narrator is excellent. The author makes me scratch my head, but I'll read the next to figure out how (Blank) takes (Blanks) actions at the end of the book. The ability to experience the book when you cant physically do so. Like all audiobooks. That and he's a great narrator. Female voices make you chuckle at the attempts, but... what can you do? Probably, but I would know I would hate the last 3rd of the movie. How is it possible to have such a great main character then turn them stupid so many times you question if the author fell asleep while writing?! I love the story overall, but there were many times characters who were the best and brightest, turned down right stupid. I read a great review of this book. It sounded like it had everything I wanted-likable characters, action, emotions and a good narrator. Nope. The story started out so slow and going over what skimming over the exciting things that happened in the previous books while the current story was so boring. The emotions were high school level mostly about jealousies and crushes. And the narrator was terrible at female voices. Imagine all women sounding like Marilyn Monroe including military personnel. The male characters were okay but nothing special and a bit hokey. Sorry. There might be people who would enjoy this book but I think it's fit mostly for young readers although I didn't finish it so I don't know for sure. Oh did I mention the stilted dialog with very little or no contractions? Really a sub par book. Auch im dritten Teil wieder neue Umgebung und Personen. Die Geschichte wird weiter entwickelt. Der Sprecher der ersten beiden Folgen gefiel mir persönlich besser und der Wechsel war irgendwie ein Bruch. Aber auch dieser Sprecher ist gut. Ich musste ab und an Pause machen ....ansonsten verging die Zeit wie im Fluge.